Hello, lovely people! Happy Monday! I have always been one of those people who has to start their goals on a Monday. It just feels right! Who's with me?! I used to be the type of person that would make so many goals at the beginning of the week, that if I didn't stick to one goal, I would just quit for the week. Instead of making all these goals for the week, I am picking three things that I want to accomplish. I also want to share my goals here to keep me accountable. Yesterday, I did some really quick meal prepping for the week. 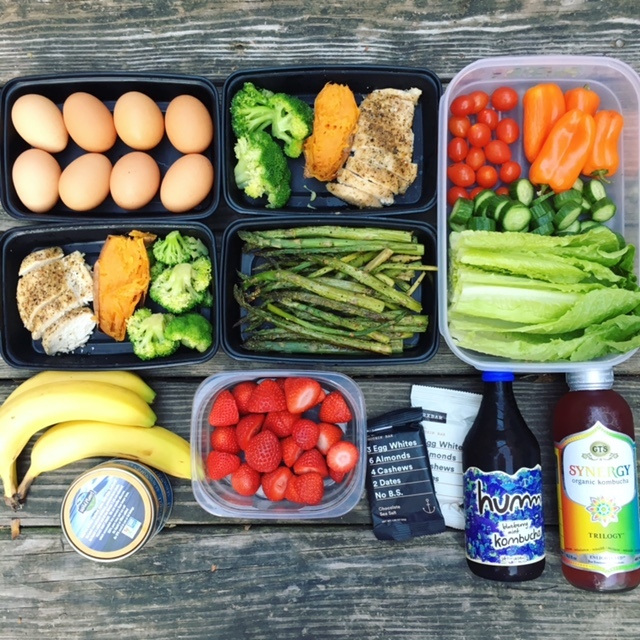 I weighed everything out, and planned out some simple meals for myself, and my family. I meal prepped some baked chicken breast, hard boiled eggs, lots of veggies for salads - and kombucha. I really love drinking kombucha! RX Bar's are a great source of protein if you're on-the-go and need something quick. I usually like to eat them after a run or working out. I also made oven roasted asparagus. It's always great to have for breakfast, lunch, and dinner! Here's to a new week, and staying on track!